One minute you can be surfing, the next hiking through a forest thousands of years old. 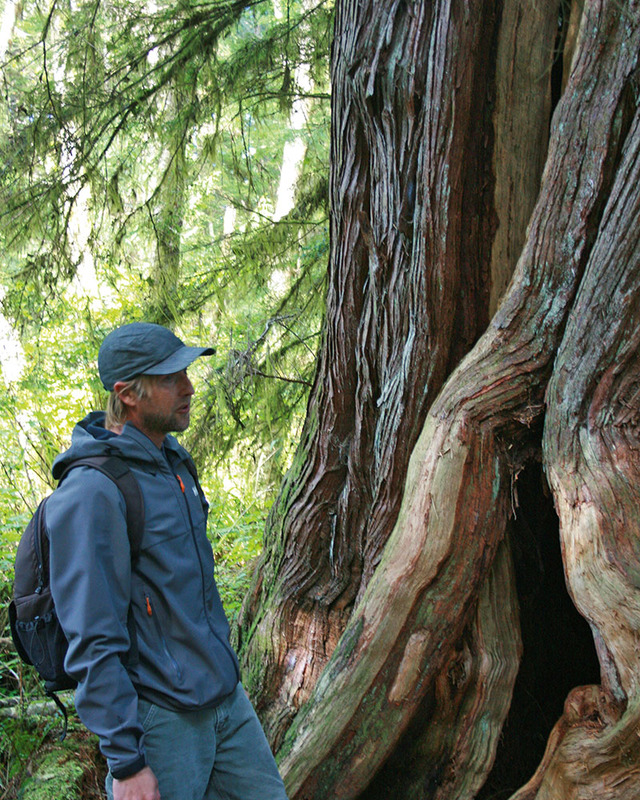 Carrie Hutchinson takes a tour of Vancouver Island, a nature lover’s paradise. Had a David Attenborough film crew been on board they couldn’t have asked for a more perfect moment. We’re passing an outcrop topped with a light beacon. It’s surrounded by rocks and dotted by resting sea birds. Kelp rises and falls around it with the gentle waves. There are also a few harbour seals camped on the rocks enjoying the sunshine. Suddenly a pod of orcas rushes the islet, sending a flood of water over the rocks. The seals hold firm as the whales swim off again. Then one, a cute little baby, decides to flop into the water, and the dorsal fins of two orcas cut through the water back towards it. On the boat, there is a sharp intake of breath. Everyone, it seems, is slightly torn. Will the seal be safe or will we bear witness to one of those moments that reveals the horrifying-slash-awe-inspiring side of the natural world? But there’s no sudden seal-like screaming or a slick of blood on the surface of the sea. Soon enough the whales rejoin their family and we’re left to assume the tiny seal lives to swim another day. A fishing boat on Clayoquot Sound, Vancouver Island. “They’re harbour seal specialists,” says Casey Brant, one of the naturalists accompanying us on this whale-watching trip with Victoria’s Eagle Wing Tours. Probably a good thing they’ve failed today, if only for the sleep patterns of the small children observing the action from the boat. We’d only been out on Haro Strait for about half an hour when we first came across the pod. There’s not much to it, really. The captain simply looks for a cluster of other whale-watching vessels and heads towards it. Once there, everyone scours the surface of the water, looking for the telltale tall dorsal fins. For the next hour or so, we move slowly, trying to predict when they will next pop up. There’s no way to tell where they’ll appear. Sometimes they porpoise alongside a research boat. Occasionally their huge fins cut through the water so close to the catamaran you feel as though you could reach out and touch them. None of them breaches or displays any of the surface-slapping antics seen on a wildlife documentary, although this isn’t uncommon. This pod is hunting and its prey – seals, porpoises and, very occasionally, minke whales – can hear, so stealth is the key to success. There’s another pod of whales seen in this area, and they’re a lot more boisterous, even when hunting, since they follow salmon, which can’t hear their splashing or underwater vocalisations. After about an hour, the captain decides it’s time to head into the Salish Sea – we’re so far south in British Columbia it wouldn’t be surprising if we are in US waters – to see if we can spot any humpbacks. It’s October and the right time of year, but you can never be sure whether they’ll be passing through. It must be our lucky day though, because we don’t have to go too far before a spray of water signals a big guy off in the distance. We edge closer, watching as it moves through the water before one big arch sees its tail flip up then descend into the deep. These monsters of the ocean can stay submerged for as long as 35 minutes before they have to take another gulp of air. In all, we spot seven or eight within about 45 minutes, the folks on the boat oohing and ahing as each disappears beneath the waves. Soon, as we head back toward port, chuffed with the day’s epic sightings, there’s one more treat. A huge flock of seabirds has spotted a bait ball and is squawking, flapping, diving into the water and blocking out the sun that’s dipping in the sky. The easy way to transport boards during the Queen of the Peak competition. Really, it’s just another day on Vancouver Island on Canada’s southern Pacific coast. At 31,285 square kilometres it’s a fairly substantial chunk of land (about half the size of Tasmania), but it is most remarkable for its proliferation of wildlife. On its northwest coast is Port Hardy, home of Great Bear Lodge. There are also a number of small seaside towns, including Nanaimo, where visitors snorkel with harbour seals, and Tofino, our ultimate destination. After a few false starts due to weather – fog is common, making flying conditions difficult – we arrive to find the Queen of the Peak surf competition in full swing. The wind is biting, but the cool weather doesn’t seem to put anyone off. In front of the Long Beach Lodge Resort, boards are transported along the sand via bike, wetsuitted women sit on logs of driftwood before their turn in the waves, and dogs scurry around chasing one another and begging for pats. Out on the water, pairs face off in the competition. We grab a bite from Tacofino and enjoy the action. Apparently this is also a popular spot for beginners. There’s a long, soft slope out past the water’s edge and the waves break in water that’s not particularly deep. The guys at the resort’s Surf Club kit people out and take them for lessons. But the water temperature is only about 13ºC, so instead of splashing out we go for a wander into the forest with Josh Lewis. When he’s not teaching people to surf, he takes photos and leads eco tours. Vancouver Island is split down the middle by a mountain range and we’re now on the wilder, wetter west coast. Just a few minutes’ stroll from the lodge we enter a temperate rainforest, where huge conifers reach toward the sunshine. “If they haven’t been removed by man, they’ve literally been growing since the ice age,” says Lewis. This, he tells us, is the traditional land of the Nuu-chah-nulth people. They had a rich, varied culture thanks to the offerings of the forest and sea. “They only spent about three or four hours a day hunting and gathering,” he continues, pointing out salmon berries, which ripen early each year, and antiseptic deer ferns (the Nuu-chah-nulth saw deer who’d lost their antlers rubbing the wounds on the plants and soon realised why). There’s also a natural wildlife corridor here, where you can spot wolves, bears and cougars if you’re lucky. Today, we see banana slugs. Everywhere. “They make up 80 per cent of the biomass in the forest,” Lewis tells us, as someone spots yet another one sliming up a tree trunk. Of course, when you’ve got some of the biggest red cedar trees in the world growing in your midst, commerce is never far behind. Protecting this forest and others nearby are local environmentalists and the Nuu-chah-nulth. In 1984, they erected a blockade on nearby Meares Island, with its 9000 hectares of pristine forest, to stop forestry giant MacMillan Bloedel from harvesting the land. It was the first time in British Columbia’s history a court granted an injunction in favour of an indigenous tribe and its land claim. As tourism has grown here, there’s been a change in logging practices, although there are only two remaining valleys in the lower third of Vancouver Island that remain completely pristine. Heading home along the beach at Cox Bay, just outside the town of Tofino. Back when the resources industries – logging and fishing mainly – were king, Tofino was a very different town. Howard McDiarmid arrived in 1955 as the town’s sole doctor, and saw the area’s potential as a destination for travellers. He pushed to have a road put in. “Until 1959 you could only get here by plane or boat,” says his son Charles, who’s the managing director of the Wickaninnish Inn, the luxury lodge he built in 1996. Now the town, which has a population of about 1850 people, boasts a craft brewery that makes bevvies like Hunt & Gather Kettle Sour, Kelp Stout and Spruce Tree Ale, a coffee roasting company, a store selling artisanal chocolate and restaurants like Wolf In The Fog, where chef Nicholas Nutting creates menus “inspired and influenced by the place, people and produce”. They are like the urbane cherries on the wilderness cake. With Wolf In The Fog coffee firmly in hand, we wander down near the water. Kayakers are getting ready on one jetty as we head for Jamie’s Whaling Station. Tofino is one part of the Clayoquot Sound, where tiny islands and rocky inlets are home to some of Vancouver Island’s most introverted residents. We take a seat undercover on the 40-foot Stellar Sea and cruise off. A light fog has lifted and the sun is beating down on the glassy surface of the Fortune Channel. We motor past salmon farms and fishing boats, staring out at the rocky coastline looking for our prize: black bears. Normally these guys hang in the forest, but when the tide is low they come down to the water’s edge looking for food. We see a couple of rigid-hull inflatables, passengers rugged up in waterproof overalls and propped on seats at the front of the vessel, cruising the shore in vain. Lucky it’s a beautiful morning because there’s not much bear action. It isn’t until we’re passing a vacant fishing shack that we spot her. It’s a mother bear with her cub. They’ve come out of the trees and are crossing a log, using their claws to remove the barnacles and whatever else they can find attached to the bottom of it. When they’ve scratched away all they can they continue on to the house, sneaking up on to the porch. “She’s going to be trouble,” says skipper Scott MacDonald. After all, bears and humans don’t play well together. The mother and baby cross from the shack to a tiny outcrop on a rope and head back into the trees. As MacDonald manoeuvres the vessel to where we may be able to see them again, there’s another surprise. A big male bear has come down to a rocky beach opposite. He’s fat and glossy, a good indication food has been plentiful this season. If it continues that way, he may have another month or so before he beds down for the winter and begins his hibernation. Today, he’s flipping rocks looking for rock crabs and other creatures to eat. “It’s like bear sushi,” says MacDonald. The big bear doesn’t pay us any mind as he lumbers along the shore. He’s safe here and, if the human residents of Vancouver Island have their way, he will be for many more years to come. Orca Airways flies from Victoria to Tofino. Fares cost about AU$460 return. The Fairmont Empress is a grand hotel, built in 1908 and overlooking Victoria’s inner harbour. There is a newer wing, but the suites in the old building overlooking the water are sensational. As well as being centrally located, the Empress is also renowned for its afternoon tea, which has been served here since the hotel opened – you’ll need to make a reservation. Double rooms start at about AU$410 a night. In Tofino, Long Beach Lodge Resort is a relaxed but elegant place to stay. There are 41 lodge rooms (the deluxe ones upstairs, overlooking the crashing waves, are the pick) and 20 two-bedroom cottages. There’s a full spectrum of activities run from the Surf Club – hiking, surfing, SUPing, cycling and much more – and, at the end of the day, everyone gathers in the Great Room for drinks and to watch the sun set. Standard double rooms start at about AU$285 a night. Eagle Wing Tours offers whale watching between May and October several times a day and on both open and semi-covered boats. They usually last between three and four hours. Tickets for adults start at about AU$130. 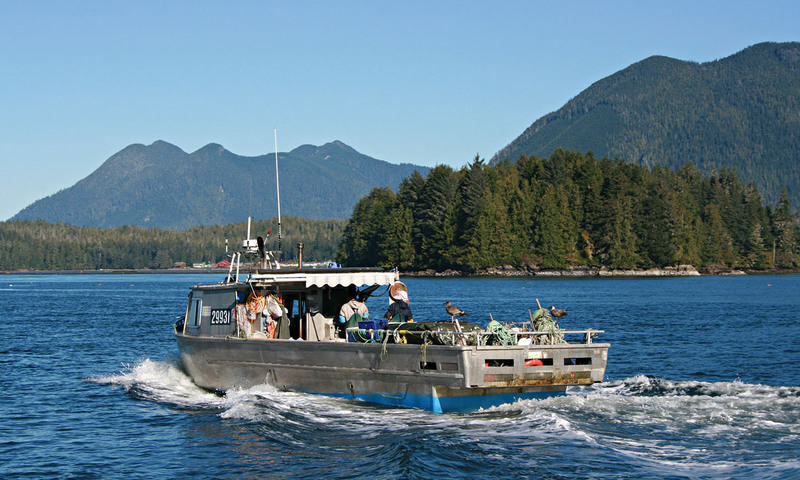 Jamie’s Whaling Station in Tofino has two- to three-hour bear-watching tours from April to October. It costs about AU$100. The company also runs kayaking tours and trips to the nearby hot springs.